The popular classic song “Shine on Harvest Moon” was published in 1908. It was created by the vaudeville team of Nora Bayes who composed the music and Jack Norworth who wrote the lyrics. “Shine on Harvest Moon” is a song about lovers sitting under a willow tree. The girl was frightened by the darkness so the boy sang to the harvest moon, asking it to shine on so she would stay. 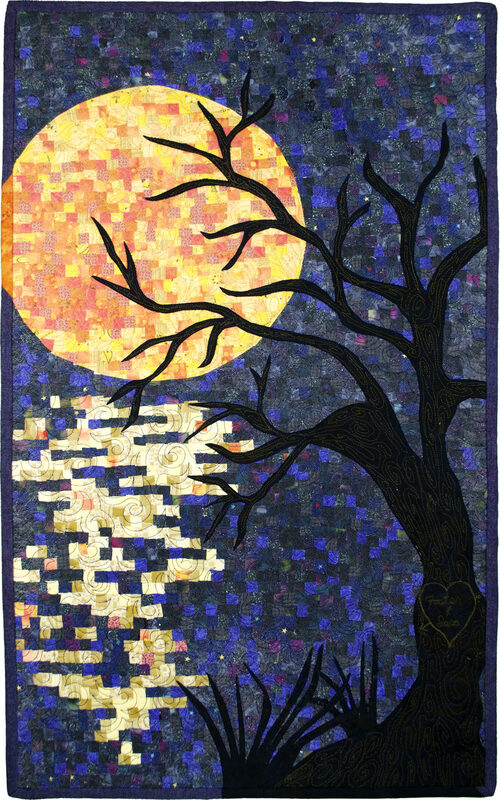 In this piece I used 100s of 1/2″ X 1/2″ pieces of blues and blacks for the background and yellow and oranges for the moon and the reflection. I then placed fine netting on top and quilted it. I added the tree and grass once the initial quilting was completed. I then quilted those adding the “carved” heart to the tree with “Foster + Sara”, representing the lovers in the song. 1/2″X 1/2″ pieces of fabric in blues, blacks, yellows and oranges, these were fused onto a muslin background I then added a fine netting with Misyfuse. Quilted the entire piece and then added the tree and grass using raw-edge appliqué. Then quilted the tree and grasses. 100% cotton fabric, batting and thread. Netting is nylon.